After witnessing two of Banksy’s pieces of work (Reaper and Sirens of the Lambs), I was very interested in seeing more of Banksy’s work; particularly the kind of artwork that he is most famous for: silhouettes. 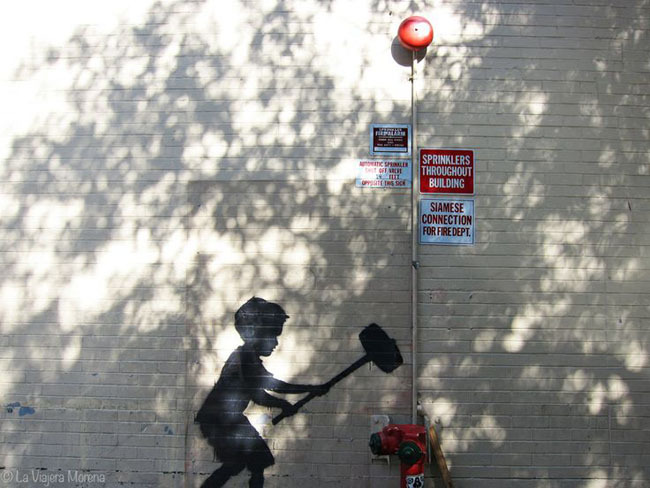 I ventured to 79th Street on the Upper West Side of Manhattan to the site of Banksy’s famous ‘Hammer Boy’. I was happy to find out that the owner of Zabars (the grocery store that owns the building), has installed a camera and plexiglass around Hammer Boy to make sure that the piece would not get vandalized. While I was observing the piece, I noticed that a number of people were stopping to take pictures of the artwork that Banksy created, so I decided to interview a couple of them to see what they thought about Hammer Boy. I received great reactions of people who loved the piece, and I also received some insightful comments about what people thought Hammer Boy represented. Have you ever seen any of Banksy’s work? What did you think about it?